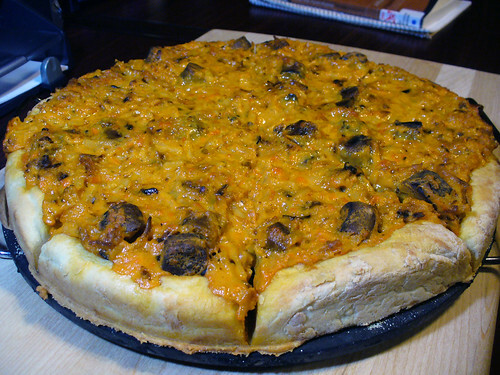 Hash browns, breakfast links, and cheddar cheese – talk about your breakfast pizzas, people! This one wins ALL THE AWARDS! But wait. Let’s start at the start, shall we? 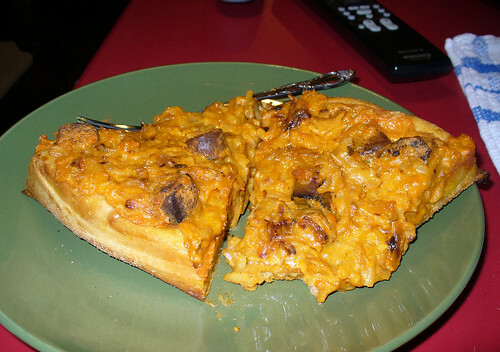 For my first attempt at a vegan hash brown pizza, I took a rather simple approach, layering cheddar Daiya cheese with a skillet full of cooked hash brown potatoes and vegan breakfast links, followed by another sprinkling of cheddar cheese for good (read: gluttonous) measure. While tasty, the finished result was a little on the dry side for me. I like my pizza saucy and cheesy, yo! So for my second go-round, I decided to use a cheese sauce (as opposed to fresh-from-the-bag cheese shreds) for a little extra moisture. And huzzah, was it a success! A hot, melty, cheesy, oozy, gooey success! The cheese sauce – a mix of Daiya and Follow Your Heart cheeses – is the same concoction we use in our vegan mac & cheese (and, incidentally, our vegan mac & cheese pizzas) … so this should give you some idea of how super-shiny this pizza really is! 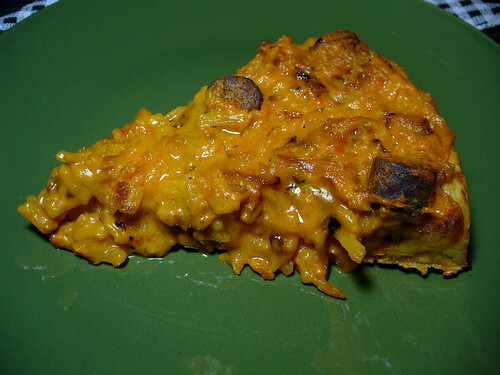 It’s like a mac & cheese pizza, but with potatoes in place of pasta! My trend of layering carbs on top of carbs and serving them sides of extra carbs continues, muahaha! Seriously though, this is one of my favorites yet, third only to the Cheesy Vegan Tater Tot / Garbage Plate Pizzas and the Vegan Bacon & Cheddar Double Potato Pizza. THAT GOOD, IT IS! Anyway, enough talk. More pizza! 1. Stir the water, sugar and yeast together until dissolved. Add the olive oil and salt, as well as any extra spices or seasonings you desire. Stir in the flour until blended. Form the dough into a small ball and let rest in large bowl, covered loosely with a towel, anywhere from 30 minutes to two hours. Make the hash browns and breakfast sausage! 2. In a large skillet, heat three tablespoons of olive on medium. Add the diced onions and cook on medium until translucent. Add the hash browns and cook according to the instructions on the package. (I.e., cook on medium-high for roughly ten minutes – or until the bottom layer of potatoes becomes brown and crispy – and then flip the potatoes as best as you can using a large spoon or spatula. Continue to cook for another ten minutes or so. Don’t stir the potatoes as you cook and do not cover the skillet.) Add salt and/or pepper to taste. When done, remove from heat and set aside. 3. While the potatoes are cooking, heat two teaspoons of olive oil in a small frying pan. Dice the vegan breakfast sausage into small pieces (eighths or so) and then toss in the frying pan. Cook on medium, stirring frequently, until the pieces are golden brown. Remove from heat and set aside. 4. In a medium-sized saucepan, bring the soy milk to a boil. Reduce the heat to medium and mix in the margarine, stirring until melted. 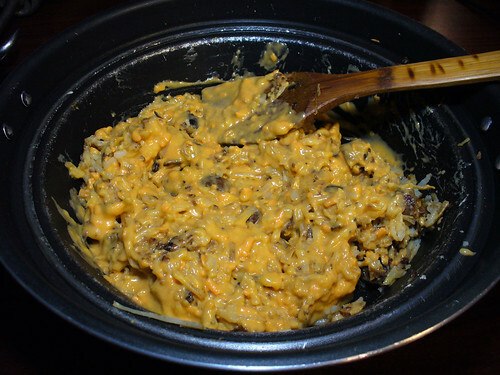 Add the cheese shreds, stirring gently until they combine with the liquid to form a creamy cheese sauce. 5. When done cooking, combine the cheese sauce with the hash browns and breakfast links, mixing well. 6. Remove from heat and allow to cool for roughly ten minutes before assembling the pizza. You want the cheese to be semi-congealed for easy application! Assemble and bake the pizza! 7. Once you’re ready to make the pizza, preheat the oven to 425 degrees F.
8. As the oven is heating, spread a dusting of cornmeal onto your pizza stone (or lightly coat your pizza pan with cooking spray). Using fingers dipped in olive oil (optional), pat the dough onto the stone, spreading it out evenly. 10. Bake at 425 degrees, for between 15 and 20 minutes for a single pizza, or 30 minutes for two pizzas. Look to your crust to determine when the pizza’s done cooking, as the potatoes are basically done before they go in. 11. Enjoy warm, preferably with a fork and bib! 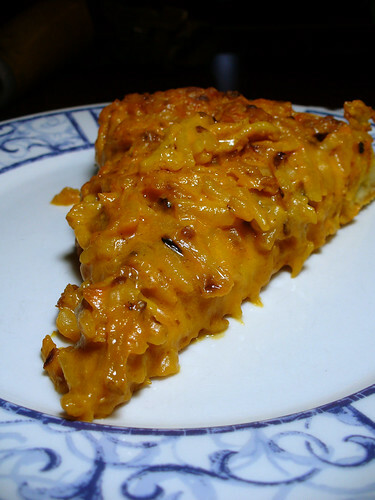 Suggested variations: If you’re the type of person who likes ketchup and cheese on their hash browns, why not add some ketchup to this pie? You can either spread it onto the pizza dough first – much as you would red sauce – or add it as a topping after the pizza’s cooked. 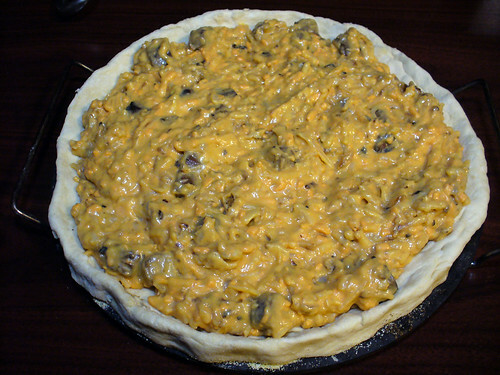 Likewise, if you’re a hot sauce person, add a sprinkle before serving – or mix a few sprinkles in with the cheese sauce! Last but not least, dress up the hash browns with your own favorite spices and/or veggies. Posted: 01/4/12 at 12:29 pm. Filed under: Food & Recipes.